Robot dog - man's best friend or a no-fat nag? LONDON, Aug 31 (Reuters) - It could be a dream or a nightmare -- scientists have created a robotic dog that tells you when it's time for your daily walk. Researchers at the Massachusetts Institute of Technology in the United States plan to recruit Sony's "canine entertainment robot" Aibo into the obesity police. The dog would be connected by radio to the bathroom scales, a pedometer and a personal organiser in which the owner would note his daily food intake, New Scientist magazine reported on Wednesday. "It is promising to look at mobile robots for defining behavioural change," computer scientist Tim Bickmore at Boston University's School of Medicine was quoted as saying. 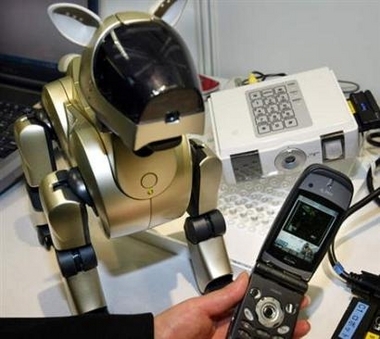 Reuters AlertNet - Robot dog - man's best friend or a no-fat nag?